140 Gram Double Vinyl in Deluxe Gatefold Sleeve + a 24-Pages LP Size Booklet. Ten years on, intrepid crate-digger Samy Ben Redjeb unveils a new treasuretrove of Vodoun-inspired Afrobeat heavy funk crossover greatness. 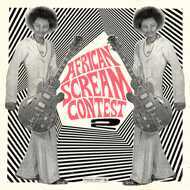 Right from the laceratingly raw guitar fanfare which kicks off Les Sympathics’ pile-driving opener, it’s clear that African Scream Contest II is going to be every bit as joyous a voyage of discovery as its predecessor. And just as you’re trying to get off the canvas after this one-punch knock out, an irresistible Afro-ska romp with a more than subliminal echo of the Batman theme puts you right back there. Ignace De Souza and the Melody Aces’ “Asaw Fofor" would’ve been a killer instrumental but once you’ve factored in the improbably-rich-to-the-point-of-being-Nat-King-Cole-influenced lead vocal, it’s a total revelation. Like every other Analog Africa release, African Scream Contest II is illuminated by meticulously researched text and effortlessly fashion-forward photography supplied by the artists themselves. Looming large - alongside Lokonon André - in the cast of biopic-worthy characters to emerge from this seductive tropical miasma is visionary space-nerd Bernard Dohounso, who laid the foundations for Benin’s vinyl predominance by importing and assembling the turntables that would play the products of his Bond villain-acronymed pressing plant SATEL, a factory that would revolutionise the music industry in the whole region. One especially irascible Vodoun-adept was Antoine Dougbe, who styled himself “The devil’s prime minister” while turning ancestral rhythms into satanically alluring modern beats. As Orchestre Poly-Rythmo songwriter Pynasco has observed sagely, “Evil is not elsewhere, evil extends into the house”. And African Scream Contest II is a gloriously cinematic road-trip through an undiscovered realm of music lore whose familiarity is every bit as thrilling as its otherness.